MONDAY/LUNES 3/3/14, 6:00PM @corner of Elm and Broadway – Marking the Cost of War: A brief ecumenical prayer and stone laying ceremony to count the victims and cry out for peace/Marcando el Costo de la Guerra: Una breve oración ecuménica y una ceremonia de colocación de la piedra para contar las víctimas y clamar por la paz. TUESDAY/MARTES 3/4/14, 9:00AM @New Haven Superior Courthouse, 121 Elm St. – Courthouse Rally for Justice at Gourmet Heaven. Check out recent press coverage of Gourmet Heaven on Univision and Yale Daily News. Also check out an opinion piece by Henry Fernandez calling on Yale properties to guarantee a $15 living wage, and the response from Mayor Toni Harp./Rally de Justicia en Gourmet Heaven. WEDNESDAY/MIÉRCOLES 3/5/14, 12:15PM @New Haven Green – “Ashes to Go” at Chapel on the Green/Servicio de Miércoles de ceniza en Capilla en el Verde. THURSDAY/JUEVES 3/6/14, 6:00PM – Canvassing for the People’s response to “Hill to Downtown;” contact us for more information/Escrutinio de la respuesta del pueblo a la “Colina a Downtown,” haz contacto con nosotros para recibir más información. THURSDAY/JUEVES 3/6/14, 6:30PM @Hamden Middle School 2623 Dixwell Ave, Hamden – Hearing on United Illuminated’s tree trimming & removal plan, call us to get a ride/Audiencia sobre el plan de Estados Iluminado de la eliminción y poda de árboles, llámenos para obtener transporte. Click here for more information/haz clic aquí para leer más. SATURDAY/SÁBADO 3/8/14, 10:00AM-5:00PM – Canvassing for the People’s response to “Hill to Downtown;” contact us for more information/Escrutinio de la respuesta del pueblo a la “Colina a Downtown,” haz contacto con nosotros para recibir más información. 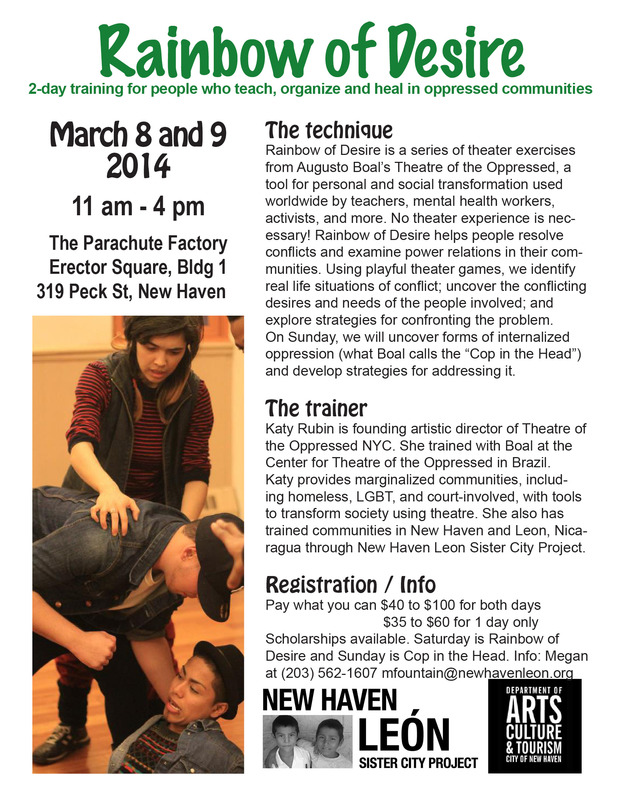 SATURDAY & SUNDAY/SÁBADO & DOMINGO 3/8/14-3/9/14, 11:00AM-4:00PM @The Parachute Factory, Erector Square, 319 Peck St. Building 1 – Rainbow of Desire: Theater of the Oppressed training/Arco Iris del Deseo: Taller de Teatro del Oprimido. 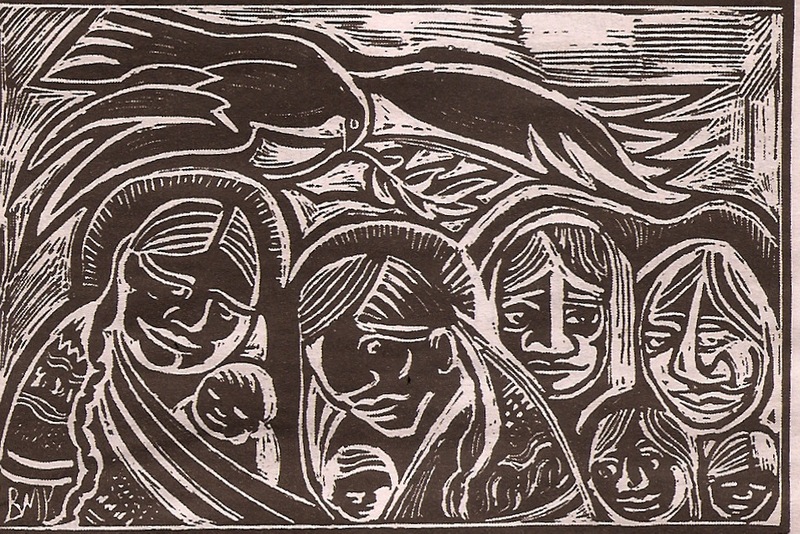 MONDAY/LUNES 3/10/14, 5:30PM @Amistad – Mass/Misa.